Georgia Tech paleoclimate scientist Kim Cobb made a disturbing discovery when she saw her 8 year-old daughter’s state-issued science textbook. So essentially, children growing up in Georgia do not learn about climate change at all unless they are given the opportunity to take an elective oceanography class in high school. By the end of grade 8. Human activities, such as the release of greenhouse gases from burning fossil fuels, are major factors in the current rise in Earth’s mean sur- face temperature (global warming). Reducing human vulnerability to whatever cli- mate changes do occur depend on the understanding of climate science, engineer- ing capabilities, and other kinds of knowledge, such as understanding of human behavior and on applying that knowledge wisely in decisions and activities. By the end of grade 12. Global climate models are often used to understand the process of climate change because these changes are complex and can occur slowly over Earth’s history. Though the magnitudes of humans’ impacts are greater than they have ever been, so too are humans’ abilities to model, predict, and manage current and future impacts. Through computer simulations and other studies, important discoveries are still being made about how the ocean, the atmosphere, and the biosphere interact and are modified in response to human activities, as well as to changes in human activities. Thus science and engineering will be essen- tial both to understanding the possible impacts of global climate change and to informing decisions about how to slow its rate and consequences—for humanity as well as for the rest of the planet. President Obama has highlighted energy and climate change as two key issues that will define the rest of his term as president. So it’s particularly startling to see a state like Georgia — where top notch scientific institutions like Georgia Tech and the CDC are located — ignoring national standards so blatantly. 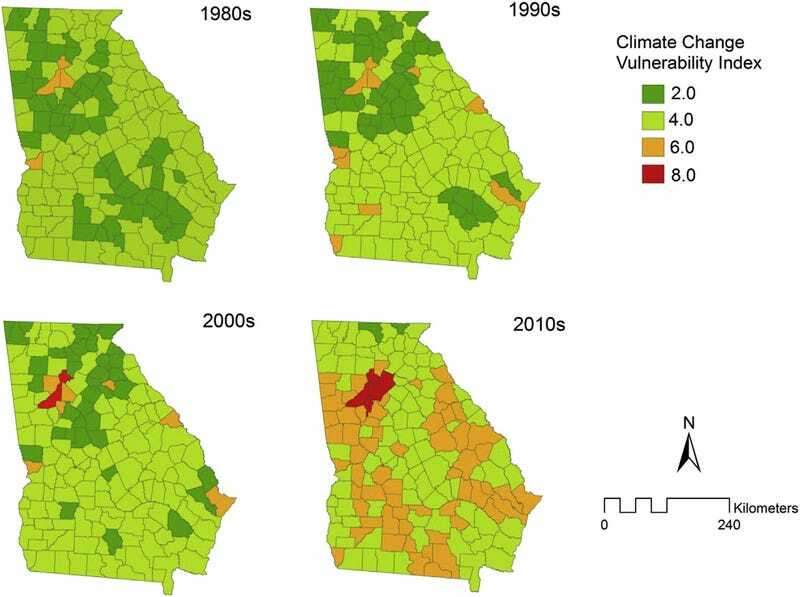 Top image: Georgia’s climate change vulnerability, from a scientific paper in Applied Geography.